Wenonah High School limited Center Point to just two points in the second quarter en route to a 52-34 triumph as the Dragons claimed the school’s sixth state championship in the Class 5A boys’ state basketball finals Saturday morning at the 97th AHSAA State Basketball Championships being held at the BJCC Legacy Arena. The Dragons’ previous state titles came in 1990, 1993, 2011, 2012 and 2013. Saturday’s championship was the first under Coach Audwin Howard’s direction. Wenonah (31-5) finished the season with only one loss to an AHSAA school. Senior guard Cameron Tucker scored 18 points, six rebounds, two assists and two steals to earn Class 5A state tourney MVP honors. Jarvise Minter added 11 points and his twin brother Justin Minter had eight points and nine rebounds. The Dragons out-rebounded Center Point (18-15), coached by Rodney Chatman, 36-21 and limited the Eagles to only 16 made field goals. Wenonah was 9-of-10 from the free-throw line and shot 44 percent from the field. Jordan Chatman led Center Point with 11 points and five rebounds. He was 5-of-6 from the field. Roderick Orr added seven points. 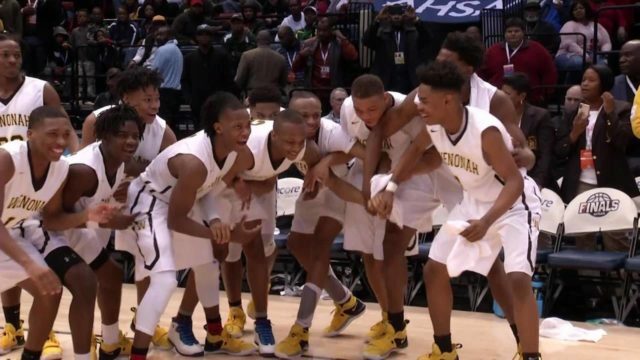 The Class 5A All-Tourney Team included: Cameron Tucker, Wenonah (MVP); Jarvise Minter, Wenonah; Justin Minter, Wenonah; Jordan Chatman, Center Point; Roderick Orr, Center Point; Roderick Harrington, Ramsay.